Press Release | Combat the 7 Deadly Sins of Lockout! Combat the 7 Deadly Sins of Lockout! Collin Warren partner at Fisher Phillips recently gave a Q&A presentation at EHS’s 2017 Safety Leadership Conference discussing some of the challenges employers face on a daily basis to ensure compliance with OSHA’s Lockout/Tagout requirements. He provided a list of the 7 deadly sins of Lockout which in turn we aim to help you combat! It is incredibly important that employers do not assume the same lockout/tagout policy is required for all machines. Simply put it is essential that all applicable equipment is identified and policies must detail all the requirements. Instructions should all be in a written format and training continually updated with any changes in machine setup or requirements. Correct training must be given to ensure compliance with 29 CFR 1910.147 (c7), all workers must be able to recognise all potential energy sources. Furthermore they must also know the types and strengths of all relevant sources. It is often the case that companies are not in compliance simply through having the wrong person conducting lockout/tagout audits or through not following the recognised standard. All Lockout audits must be conducted annually and recorded as well as completed by an individual deemed to be an ‘authorised employee’. The incorrect use of tags is also often found to be a common error. Training including tags and their uses, lock usage and selecting the correct tag for the equipment should be given to all applicable employees. Companies must ensure that they are retraining workers and refreshing information in terms of equipment changes as well as policies and procedures at any time where changes are made. Employers must be also be able to demonstrate this training is being carried out and maintained. 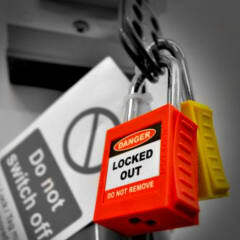 Often lockout/tagout incidents are caused by the release of stored energy. Employers must address unexpected mechanical energy when implementing procedures and teach employees to do the same. Employers must take the time to establish whether lockout/tagout applies. They should also know the difference between a machines service and maintenance as well as tool changes, adjustments and standard operations. This information must regularly be shared with employees who must also be updated of any changes as and when they are made.